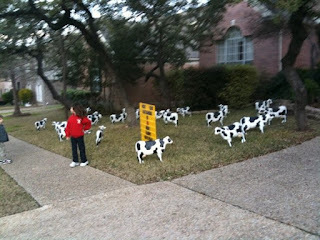 I got the idea for these cow cookies when my friend across the street got "COW-ed" for her birthday. The sign says, "Holy Cow! 'A' is 30!" I hope she's not "udderly" grossed out by the not-so-wholesome holsteins...they're actually quite tasty and smell ten times better than REAL cows!